iPhone 8 renders have been leaked on multiple occasions, but this fresh leak brings a video showing the being held in a hand for the first time. This iPhone 8 video leak corroborates everything leaked in the past, and shows the smartphone from the edges, front, and back. Two other leaks have hit the Internet at the same time, and one contradicts the video leak. The iPhone 8 video leak was uploaded by tipster Benjamin Geskin who is also responsible for several render and live image leaks in the past. The video shows the iPhone 8 being held in a hand rotated front and back. The smartphone is seen sporting a glass back, a vertical dual camera setup, and a metal frame. The power button is a bit longer than before, and the frame also seems a bit wider and thicker than the current generation iPhone models. At the front, there is no Home Button seen, and the entire real estate appears to be occupied by the display. More clarity would have been gained if the display was turned on, but sadly that was not the case. Coming to the back, there is no iPhone or Apple logo seen anywhere, reiterating that this is a dummy unit. There is no certainty that this unit in the video would make the final cut, as Apple has reportedly run into various hiccups regarding yield of various components. Apple is also reportedly expected to launch the iPhone 8 a little late, due to various production issues. Since no fingerprint sensor was visible, it can be presumed that if this leak is correct, Apple has indeed used the much rumoured display embedded Touch ID sensor. 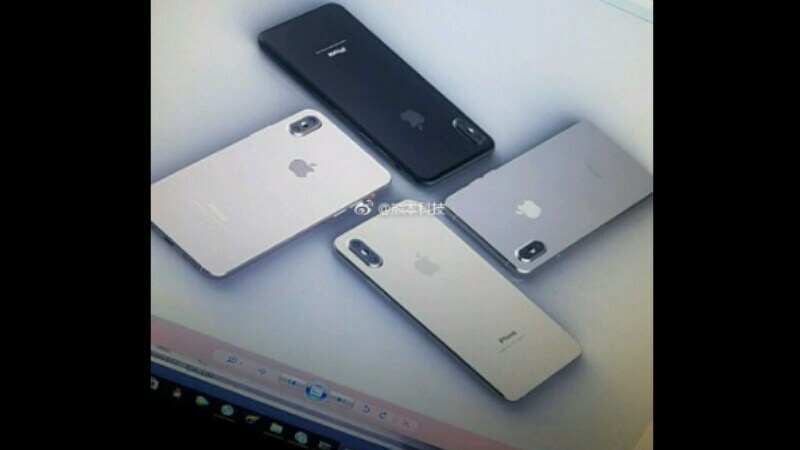 More renders have also appeared on Weibo showing the iPhone 8 in a different design format than Geskin’s. While the vertical dual camera setup remains, the display is not edge-to-edge, and the fingerprint scanner is seen at the back, refuting rumours of an embedded Touch ID. The leak shows the iPhone 8 in Pink, Rose Gold, and Black colour variants. Notably, Geskin tweeted saying that this leak is false, and the iPhone 8 won’t look like that. We hope he is right! 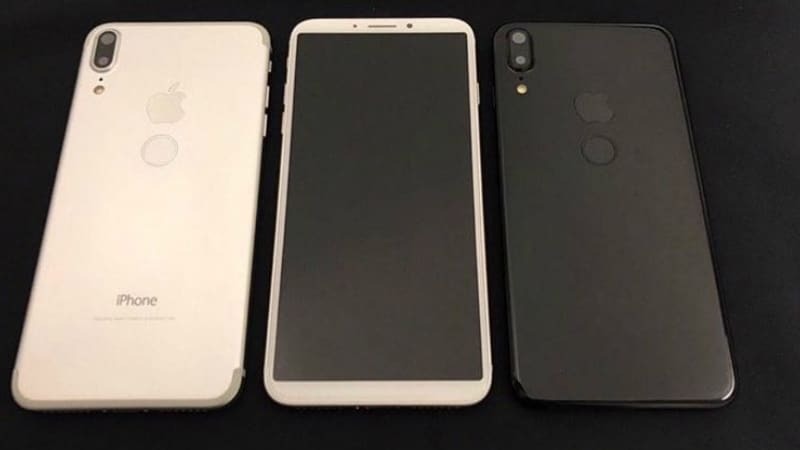 Another image shared by MobileExpose also shows the iPhone 8 in four colours – Silver, White, Black, and Gold. Only the back of the device is exposed here, and there’s no fingerprint sensor seen at the back, reducing the credibility of the Weibo image leak. Separately, a report by The Bell, shared by The Investor claims that Samsung has been roped in for next year’s OLED supply as well. The report states that Apple has agreed on a deal with Samsung to produce OLED panels for the iPhone 9 as well. Interestingly, the report also indicates that there will be two new size variants introduced for the iPhone 9 – 5.28-inches and 6.46-inches. Samsung will reportedly ship 180 million units of OLED panels next year. As for 2017, Apple is expected to introduce 4.7-inch iPhone 7s, 5.5-inch iPhone 7s Plus, and 5.8-inch iPhone 8. All the three devices are tipped to sport wireless charging, but OLED panels will only be used on the anniversary edition iPhone 8. Geskin also reiterates in a separate tweet that the iPhone 8 will sport 3D face scanning, be powered by the 10nm process A11 Chip, run on iOS 11, and sport AR features.